2 Sketches 4 You - Have A Sweet Birthday! I hope your weekend was awesome - mine was really nice - (more on that tomorrow) but I am still recovering from traveling and am amazed that it is already Monday! Isn't it crazy how fast time is flying? 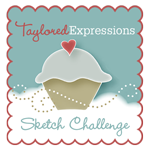 Thanks so much for visiting my blog today and I hope you get to play along with this week's sketch challenge!! Hope your week has been going awesome! Our week has been so busy - it seems like every night I come home exhausted and my mojo is gone - and last night, I was in bed super early, but couldn't sleep (so I decided to come and play :) I just got this new yummy BG (Indian Summer) and couldn't wait to play :) There is just something about these colors that makes me want to crunch some leaves, wear a scarf and go for a walk in the woods, and have a cup of tea after coming home. 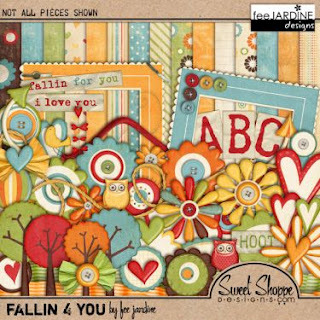 I absolutely love love love fall - and these papers and this stamp that I used just make my heart so happy :) I used Julee's seriously mojo-licious sketch from this week (those scallops had me swooning I tell ya'!) 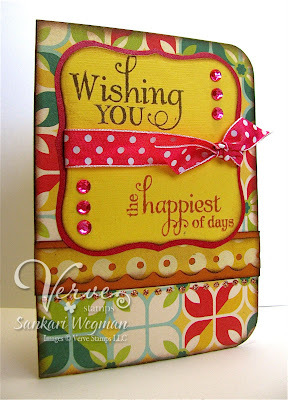 and used one of my favorite sentiments from the new Verve release Harvest Blessings. 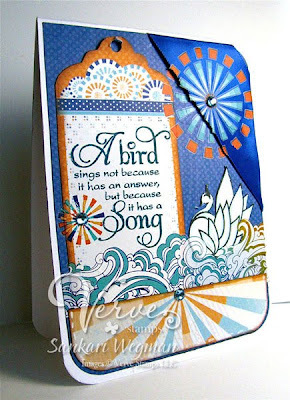 Here is another card make with the same Swan song set -but as you can see it has a total different feeling - these are some of my new FAVE papers - seriously YUMMY!!!! 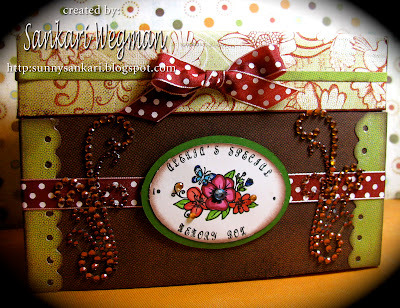 Accessories: Spellbinders, ribbon from Taylored Expressions, corner rounder, bling from Kaiser Craft, liquid pearls, Threading Punch from Fiskars. 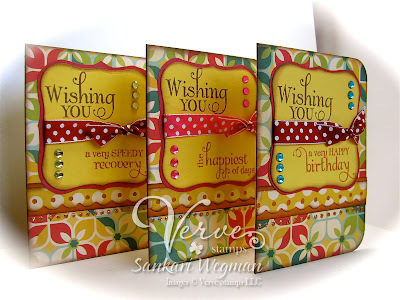 There are so many more wonderful sentiments in this awesome set: Wishing You! 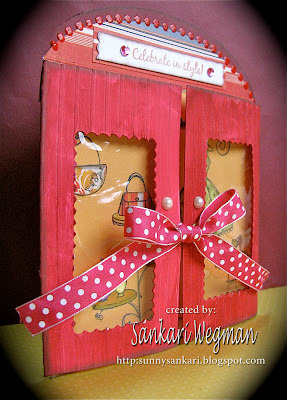 It covers every kind of card that you would want to make. All of these stamp sets are in the September Bundle that is on Sale!! from now till Weds. or as supplies last - so make sure to go check it out HERE!!! I hope that you are all having a fantabulous week so far and are getting excited for the upcoming weekend!!! WOOT!!! And if you need some mojo - head on over to the Mojo Monday Blog - for it is sure to get your creative juices flowing!!!! 2 Sketches 4 You - Laura's sketch #35 - Trick or Sweet! 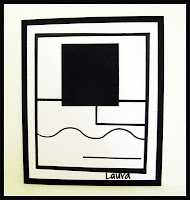 This week over at 2 Sketches 4 You, Laura has an awesome sketch #35 for us to play along with! 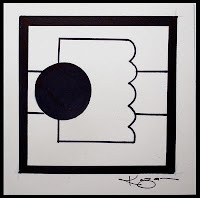 I LOVE the square element of the sketch and used it as a window. 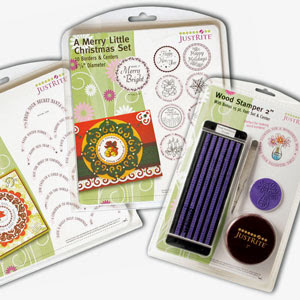 This fit perfectly with this week's sponsor's is Creative Cuts and More which comes with elements to make card making easy - there are kinds of designs and cuts that are ready to go - you just assemble. I was surprised at how quickly my card came together. 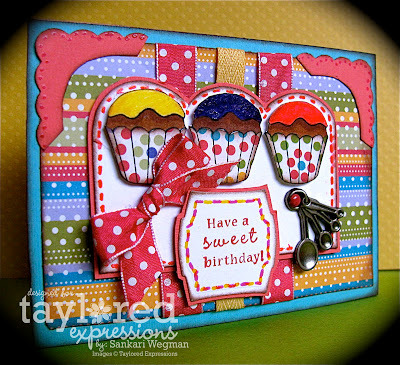 I used their Square Window Card design and created a little treat or "sweet" card using the cutest little vampire I know (okay except for Edward! 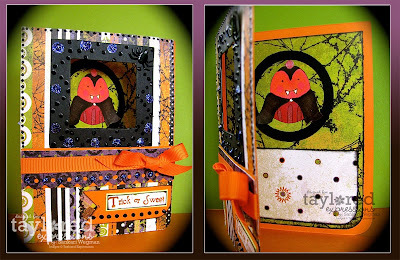 :) from the Trick or Sweet stamp set. And check it out: !! 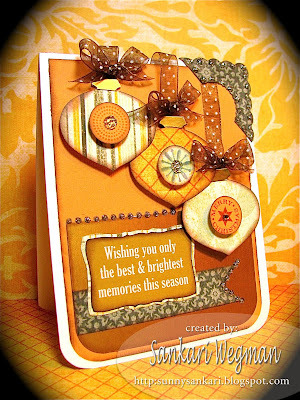 This week Creative Cuts will be offering the Fall Occasions card kit to one lucky winner who plays along with the 2 Sketches 4 You sketch challenge: Check out all the goodness that is in one of these kits --- I mean WOW!!! All of that in one kit?! Get OUT!!! 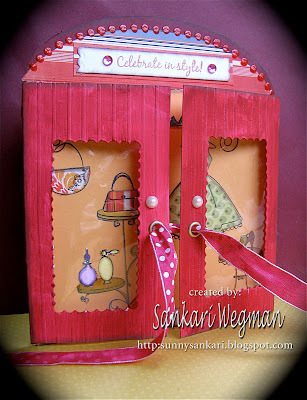 Check out all the amazing samples from our lovely ladies over at 2 Sketches 4 You!!! Can't wait to see your wonderful creations!!!! Hope you are all having fabulous Monday!!! First of all, this stamp set is so cute and I LOVE the punch for the ornament! SO cute! And secondly I am now officially a fan of rub ons! its so fun to use! 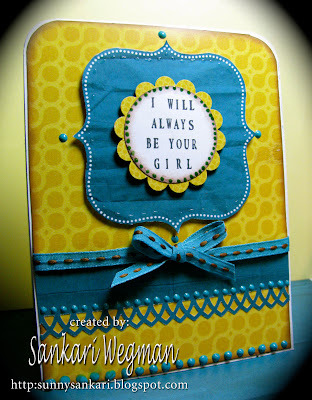 I used the white rubons for this card I was just amazed at how quickly and it made the card come together! Hope you play along with us!!! Get out your colors and join us in some holiday fun!!! Please check out all the beautiful samples from the ladies over at the Christmas Stampin' All Year Long blog and come on and play!!! 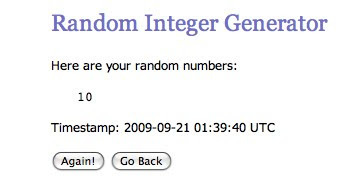 Just Rite Blog Candy Winner!!! 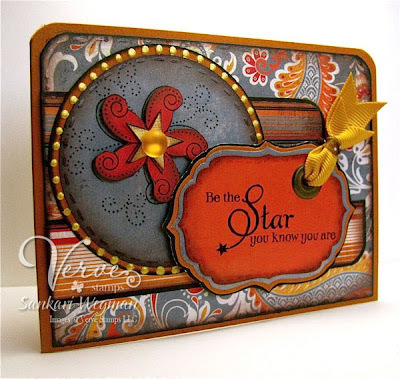 There is also a great written tutorial that you can find here:- http://www.splitcoaststampers.com/resources/tutorials/JustRitePersonalized/. And this person on my blog is: Sharon Totton! She writes: "super Cute Projects. Thanks for the inspiration"
Thanks so much Sharon for visiting my blog and leaving a comment!!! Please email me so that we can get your Just Rite stamps over to you!!! A HUGE HUGE thank you to Kellie Fortin and the Just Rite Stamp Company for letting me be part of the Just Rite blog hop!!! Your generosity and sweetness is so heart warming and I can't wait to crank out more Just Rite projects!!! I have so many in my head and the wheels are turning!!!! 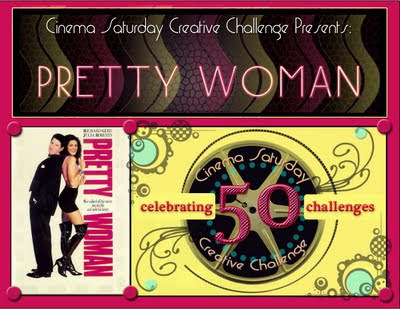 Cinema Saturday #50 - Pretty Woman - Celebrating our 50th challenge at Cinema Saturday!! Guess What?! 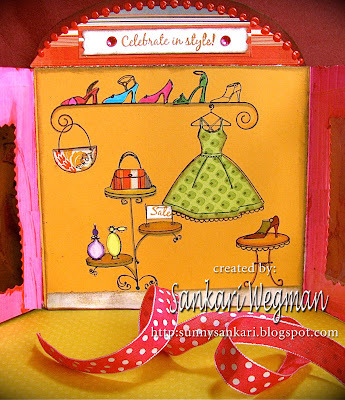 Today's Cinema Saturday Creative Challenge (where we make cards, etc inspiredy by a movie) is our 50th Challenge!!! woo-ooooo!!! 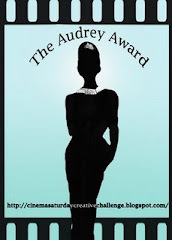 And to help us celebrate we have the awesomely talented Gina Krupsky of Gina K. Designs as one of our guest designers today who is offering some MAJOR blog candy and she has picked the movie Pretty Woman for our 50th challenge- so you have to check out the Cinema Saturday blog for more details!!! This challenge all started out as an idea last fall while I was making a card and watching a movie :) I thought - wow - that would be kinda cool to have a challenge site where you make cards inspired by movies - so I asked one of my best blogging buddies Brooke to see if she would want to join and she said yes! I met Brooke while doing Kristina's color challenges last year - and it was so amazing to click with another person in blogland and then simply wonderful to be able to get to know each other better on the phone every week - can't wait to finally meet someday already! (it will be fun because Brooke is WAY tall and I am not - but I never think of her as tall becasue she is always this little picture on my blog :) lol!) After creating the site - its been simply fantastic to meet so many wonderful players along the way - I adore Ann from Creative Antics, Tina from Travelling Mama, Amy of Tethered 2 Home, Nellie Mae of this Little Blog of Mine, Sam from Ryemilan's Stamping and Scrapping, Chat Noir, Anthonette from Chavez designs, Jaimee from a Creative Need, Scrapper Julia, Libby and her family (her brother Jon and sister Linda who also guess the Friday peeks! ), Nancy K., Erika, and of course my LOTR sister: Carol Dunsten (if I don't have links to your name I will I promise as I am typing this waaaay too late at night or tooo early in the morning!!! lol!!) Its been amazing to meet so many wonderful artists who have been our challenge players and now have melted into our families! I think that is the wonderful thing about doing challenges - getting to know people and being inspired by their visions! And speaking of visions have we got some fun things for you in store! First of all the movie! I was over the moon when Gina agreed to be our guest designer!! She has picked out the 1990 movie: Pretty Woman for the 50th challenge with the challenge requirement being Paper Piecing!!!! And Gina has a HUGE amount of blog candy that she is offering up - so you don't want to miss out that information! I remember watching this movie at slumber parties back in highschool when it came out and everytime I watched it - I was always in love with Julia's smile and her spunky attitude and I have to admit that I loved when Richard Gere was the knight in shining armor and he climbed up the fire escape at the end! so romantico! 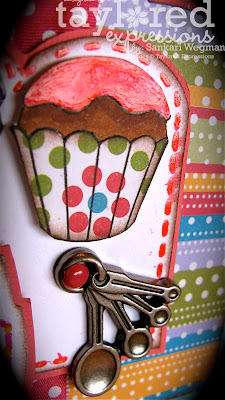 For my card I was so excited to use my new Gina K. stamps designed by Rupa Shevde called: Retro Boutique for my card. I love the shopping scene in the movie - especially the part where Richard Gere takes her shopping and loves watching her face as she begins to enjoy the shopping process. It is just too cute. And I love the part where she comes back to the store owners who were mean to her the first time and shows them to never judge a book by its cover! So to celebrate our 50th anniversary and one of my fave scenes in the movie: I created this Celebrate in Style card that is kind of like a little boutique. 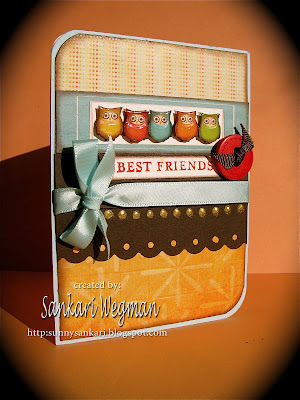 Stamps: Retro Boutique designed by Rupa Shevde by Gina K Designs. 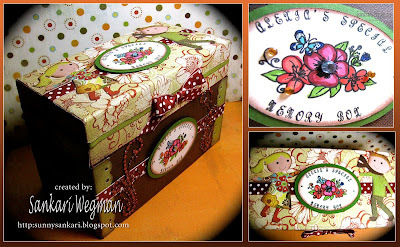 Accessories: clear plastic sheet, spellbinders die cut, eyelets, ribbon from Taylored Expressions, oval cutters from CM. Well, wow! I sure do talk alot!! Sorry for the super long blog post! Just excited that its 50 challenges old! Its amazing how it all started with an idea last fall and then led to lots of conversations with Brooke as we figured out how to do it - and now look - its 50 challenges later!! The best part of creating this challenge site has been meeting all of YOU! and feeling like a little blog family! For all those of you who are new to this challenge, I hope you will join us this week!!! Please make sure to stop by the Cinema Saturday Creative Challenge to get all the details and deadlines AND Gina is offering OVER $60.o0 worth of BLOG CANDY!!!!! woo-Hooo!!!! So make sure to check that out! Thank you SO much Gina for your generosity and sweetness!!! Guess What!?! I am so excited to share some awesome news that just became official!! I am so honored to be part of something sweet! 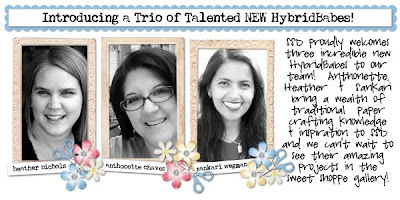 The Sweet Shoppe Design Team as one of their Hybrid Babes! The Sweet Shoppe Designs store has a TON (and I mean a TON!!!) 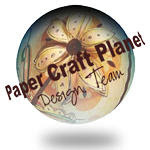 of Digital Papers, Templates and everything that you need for all your digi scrapbooking needs - they also have a hybrid team to where we combine the digi papers into a traditional card/scrapbook making!!! And I am SO excited to be part of this - along with two other brand new Hybrid Babes: the very talented Heather Nichols and Anthonette Chavez!!! The wonderful Robin Carlton who is the owner of the Sweet Shoppe Designs store just sent out a newsletter announcing this and check out the sweet little welcome she included for us!!! I am so excited to be working with Digi Media and translating that to more traditional paper making projects and cards! Ink: Rose Red from SU! 2. Don't I need a really good printer to print out digital things: Nope! I definitely have a very sorry printer and the fact that I could print stuff from my printer amazes me! If my printer could print out these yummy pages - I guarentee that yours will too! 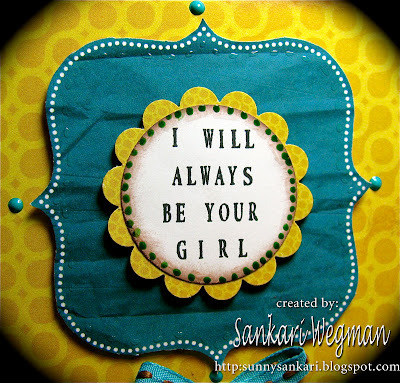 THe other thing is that I love printing out these super cute images/papers and making a card out of them. I love getting dirty in my inks and embellies and now I feel like there is an endless supply of papers that I can use again and again right at my finger tips! LOVE that! Big hugs and happy heart smiles! 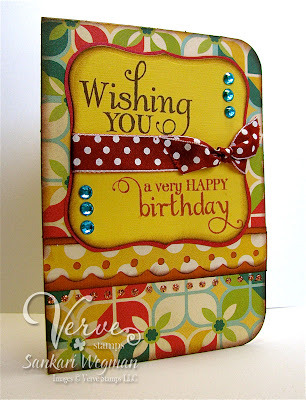 Can I tell you HOW excited I am today to show you SNEAK PEEKS from this month's Verve release!!?!!!!! Seriously SOOOO excited!!! 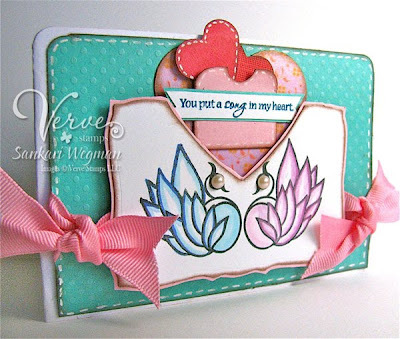 Check out the Verve Stamps blogpost to check out the awesome samples from the Verve Divas :) And don't forget that the Verve Release Party is TONIGHT - you can check out this thread for more information!!! 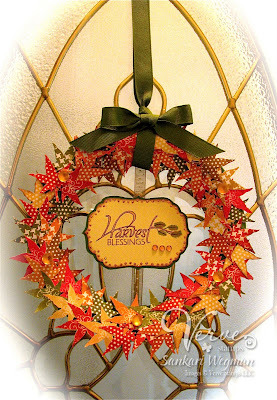 Here is a closer peek at the lovely leaves that Julee has designed for this awesome fall set. 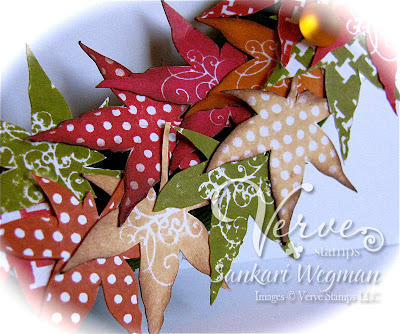 I LOVE how easy it is to create these beautiful leaves - all you need are different color inks! 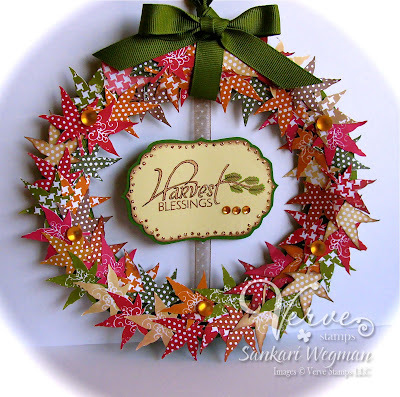 Here is a mini step by step instruction with pictures on how to make one of these wreaths. All you really need are: a paper plate (heavy Chinnet plates are the best), ribbon, adhesive glue, leaves and a hot glue gun! select your paper plate (one that is thicker is much easier to work with than a thinner plate) - trim around the rim (wait - that rhymes!!!) so that the center is cut out. 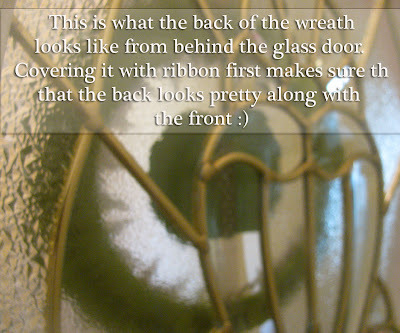 cover your plate rim with ribbon - this is so that if there is any part of the plate that is exposed - you won't see the white part of the plate and also the back of the plate will look nice too so that if you have a glass door - the back of the plate will be covered as well. I used some mono adhesive glue for my ribbon just a little dot here and there to keep it in place. get your pieces ready for adhering! 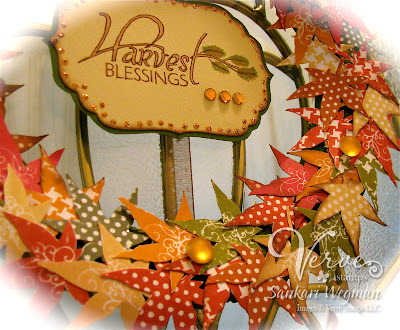 for this project, I stamped over 70 leaves from the Harvest Blessings stamp set from Verve. I LOVE that Julee has designed these leaves to have polka dots, swirls and argyle patterns. SO awesome!!! All you have to do is stamp them with different inks and you have an array of patterns and colors for your leaves. I spread them out on my work space to try to figure out how I wanted to arrange them by groupings of colors, etc. Here is the finished product of adhering all the leaves to the plate (a hot glue gun does the trick very well!) I tried to arrange them in two lines going in one direction with some leaves here and there in the middle. Have fun experimenting as to what works best for your project! And here is the finished product hanging from the door. I have a little over the door hook that I tied my ribbon onto (because our front door is already inside the main building, this plate wreath doesn't shake in the wind. For more outdoor front doors, you could use more of a foam board and then cover with a clear lacquer to protect from the elements). Thanks so much for stopping by today and visiting my blog!!! Make sure to jump over to the Verve blog to see all the samples from this week's sneak peek and stop by the Release Party tonight! It is going to be a rockin' one!!! 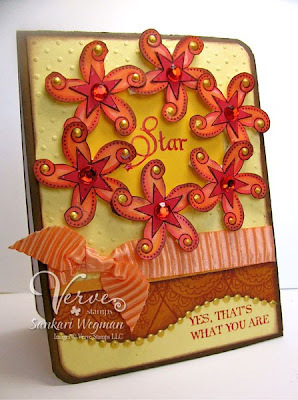 I am so excited to be part of this amazing Just Rite Mega Font blog Hop this morning and to be part of a hop like this with so many of my stamping idols is just making my head spin!!! Why is it a Mega Blog hop? Well there are 54 designers participating in this hop and it is so huge that they had to divide it into today and tomorrow! And guess what?! In celebration of the Mega Font Hope - Just Rite will be having a 30% sale on ALL of their font sets from now till the 24th of September!!! Trust me this is one sale you don't want to miss! I am so lucky to be one of those designers and can't wait to go and be blown away by all the creations that these wonderful designers have made!!! 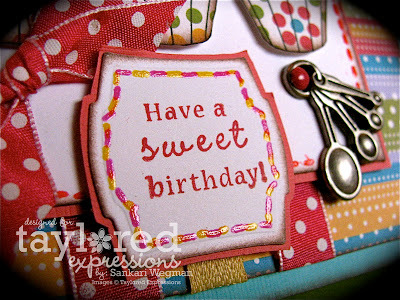 And to celebrate this Just Rite offers a number of custom styled stamps that allows you to create personalized stamped impressions in a quick second, create monograms, and also has a ton of different fonts, and other images that makes making one card/project or especially more than one card a snap! Check out their home page for more details. This morning - I have a few projects to share. One of my most favorite things about this awesome system - is how quickly it is to create your own personal message etc. with all of the different fonts and sizes that they offer. So I picked the three types of projects that I love using their fonts for. The first one is their stamps allow you to create a gift for somebody that is personalized for them (with their name or monogram) very easily. One of our dear friends is moving away. Her daughter and my son have been friends since they were 13 months old and as she packs up and leaves - I wanted to create a special box for her that she can put her favorite little things in - so I made: Alexia's Special Memory Box. This box was covered with some paper from BG and then I used the oval stamper and Special Occasions font set (check out more details here). I love this font set - its so curly and swirly - and with it I created the personalzied message and attached it to the box. The third (among a long long list) of things that I love about this system - is that you can create a beautiful sentiment for a project that you have around the house or office. And I LOVE all the borders that they have to go with their different fonts. 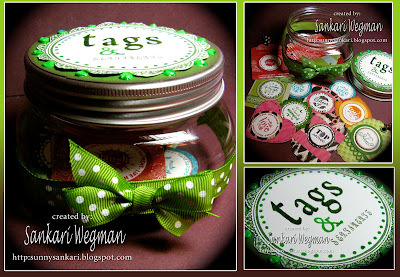 For my last project - I fell in love with this sweet jar and as suggested by my friend Michelle - I created a little container that holds both tags and sentiments that are ready to go on top of a card or on a gift. 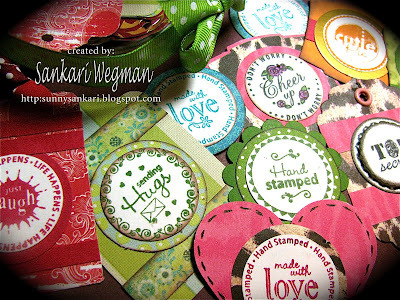 I am always in need of a quick topper for a gift and so I created just a few of the endless possibilities for gift/card toppers with these versatile sentiments using the Tiny Words and Border stamp set from Just Rite for this project to create the tags and sentiments that would go inside the jar. This set comes with a TON of different words and borders that you can mix and match for any quick card. And for the top of the bottle, I used the 3 1/4" wood stamper to create the sentiment: "Tags & Sentiments" (which is from the Times New Roman Lowercase Font set) and used the border from the Christmas Treasures Borders and Centers. And guess what else?!! Here's a little head's up on some Blog Candy Alert!!! There are going to be 3 Mystery Blog Candies being given away each day! And you definitely don't want to miss out on this yummy candy!!! How do you play?! Well, just leave a comment on the way during the blog hop - to win some blog candy - the mystery is that no one knows which designer's blog is the blog that will be giving away the candy!!! Even we don't know! There will be 3 blog candy prizes EACH DAY which will go to three random commentator's from the three random designer's blogs. So to win some of this candy - make sure to leave as many comments as you can on the way today and tomorrow!!! You will have until Sunday at noon EST to leave all your comments!!! And then check back at the Just Rite blog on Sunday Evening to see how the six lucky winner's are!!! It could be you!!! Well, I am 0ff to check out all the yumminess and eye candy!! Thanks so much for visiting my blog!!! 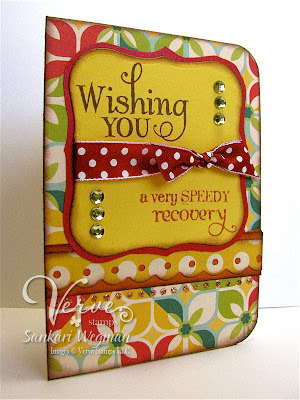 A Best Wishes Blog Hop for Our dear Melanie!